Christmas is quickly approaching. But perhaps you've still got some shopping to do? Is there someone in your life who is a food blog addict (or food blog-ger)? Someone who is constantly tuned to the food network or cooking channel? That person who impresses everyone with the fantastical things coming out of your kitchen? Or maybe there's someone who just wants to improve-someone who wants to try to get more comfortable in that crazy room we call a kitchen? Or someone who's moving into a new home? Heading out on their own for the first time? Getting married??? I'm just gonna cut to the chase: I've rounded up some of the best cooking/baking gift ideas. And all these gifts are made by one of my favorite brands-OXO (who are not in any way sponsoring this post. I just love them.) Some of the items listed here I already own, some I've registered for and am anxiously awaiting to join my little kitchen family, and some are just great basics to have! Everyone should have a good knife block-it has all the basics you need (this one includes a chef's knife, santoku knife, bread knife, paring knife, serrated utility knife, and 4 steak knives). I'm jealous of the Santoku knife-they're great for chopping vegetables! This is to help you keep those knives you just bought sharp! As low-tech. as it is, I love silicone spatulas. I use them so much and you can never have too many! This is one of the things I registered for-it's a simple and pretty way to hold your cookbooks up. This is one of my favorite OXO tools that I own-I use these scissors for everything: cutting herbs, chicken, and even just opening pesky bags. To get your tsps. and tbsps. straight! You need measuring cups and stainless steel means they'll be a bit more durable and won't melt in your dishwasher (I'm looking at you my-former-1/4-cup-that-is-now-ruined). If someone is just starting out or getting into cooking this set is a great starter! 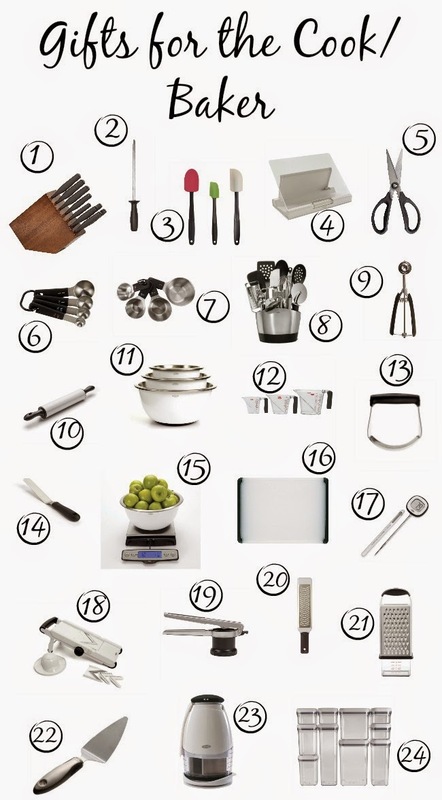 It includes basic utensils, a peeler, a pizza cutter, potato masher, ice cream scoop, etc. When cookies are being made, cookie scoops are instrumental for uniform, pretty cookies. And sometimes you want small, medium, or large cookies! So obviously all 3 cookie scoops are needed. Another registry item! OXO's rolling pin is super gorgeous and high quality. Mixing bowls are another must-have. I have 4 liquid measuring cups and I still sometimes find myself wishing I had more. So trust me-you want them. Dough blenders help you when you're cutting butter into pastry-such as for pie or biscuit dough. If someone wants to try out a little bit of decorating/cake baking then a bent icing knife is a basic necessity. I also registered for this! I have a food scale but not one that goes up to 22 pounds or is as nice. I've heard and seen lots of recommendations for this scale so it's not just me backing it! I love this cutting board. It's just great. Instant read thermometers are great for when you're trying to cook your meat perfectly. This mandoline is about to make your slicing world a bunch easier. Potato ricers help make extra creamy and lovely mashed potatoes. I use my zester mostly for grating Parmesan cheese over pastas or pizza but it can also add gorgeous chocolate shavings to your desserts and add a zesty zing of citrus to your dishes. This is on my registry and I can't wait to get it because I hate having to deal with all the cheese that accumulates under the grater-so I love that this grater has an attachable container to help collect all the cheese so I don't have to scrape it all together with my hands. When I went shopping to buy a pie server I knew I wanted OXO and it didn't disappoint. I love how the sides of the server can help cut the pie and it just does a great job. OK this one might be the registry item I am most anxious to receive--I am tired of spending bunches of time chopping things and this is going to make my life (and whoever's life you would buy this for) so much easier! And there we are! I hope you found some great gift ideas and that you are having fun getting ready for the impending HOLIDAYYYYS! AND if you're looking for some great homemade gift ideas check out my posts from last year and the year before! This post was not sponsored in any way by OXO. All opinions and thoughts expressed are my own. Post does contain Amazon Affiliate links.